I love being Tanzanian. I love being called Tanzanian. I love being Tanzanian of the Zanzibari descent. end the union today, end the union tomorrow, end the oppression, set all the Zanzibari free. founded on cannot be counted on in this time of confusion. is this union only a nasty-favouring-the-mainland-only-depressing-Zanzibar-development-situation? how come they agreed on the union so quickly after Zanzibar was free? because if we as a nation put him in power, then are all partially responsible for this chaos. as a united republic which was consummated at the height of cold war. it was during this bitter rivalry that the union was formed, what inspired the merger? 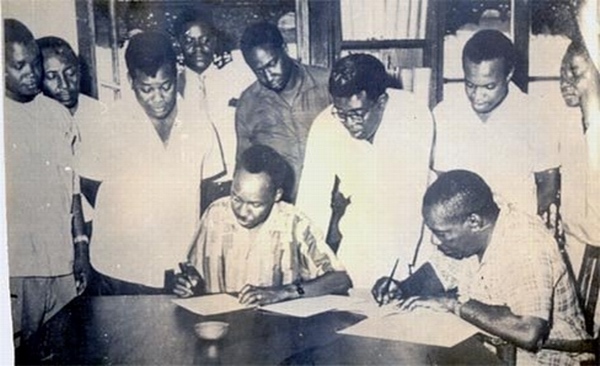 Was it the union formed by leaders of Tanganyika and Zanzibar in the pursuit of African Unity? creating favourable conditions for consummating the union, leaving all parties satisfied?? Would it have been formed if the revolution of Zanzibar had back-fired? Or would the two countries have united anyway due to cultural or other basis? If they do us so wrong why do we just stand there and take it? no one wants to stay in Zanzibar everyone is leaving? Because if this union is so bad, why don't we try to be fair and look at the other side of the coin? What will happen when all the wonderful Zanzibari businessmen in Kariakoo get asked to go back home? and alot of people died to make it that way. because if we were asked what have we done with the semi-sovereignty what will we answer then? yet we give all the big investors, companies, and hotels a big tax holiday. external trade and borrowing, citizenship and harbors, and other external affairs. we have no factories, something as simple as a small pin has to be imported? so does it stand true that we abhor the union but agree to the Chinese dumping of their products? Is that it, we have a brilliant double standard? It is wrong for the mainland but okay for the donors? What have we done that can really be referenced to us alone? In this post-revolution generation? Do we want to divide the union so that another dominator can only fill that space? Or is history so wrong, and there is no way that it will repeat itself? what will happen when we are part of a bigger thing, like the African Community becomes our dominion? and yeah I said it I am not taking it back.